Now, of course, Emmanuel House has become The Neighbor Project after merging with its long-time partner The Joseph Corporation, but this belief that every man, woman, child, and family has something to contribute remains central. 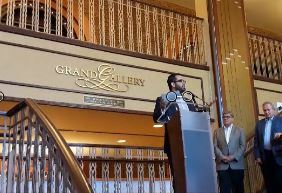 The VIDEO BELOW shows a couple of minutes from our “big reveal,” a May 15th event held at Aurora’s Paramount Theater, where the formal announcement of the merger and the new Neighbor Project name was announced. ♦ After watching the video below, watch a video introducing The Neighbor Project. ♦ Go to the old Emmanuel House website to learn more about how its home ownership program works, a program which will remain central to The Neighbor Project. And go to the Emmanuel House main page on this site, where the history of that organization continues to be kept and added to. This entry was posted in Social Change and tagged Emmanuel House, Rick Guzman, The Neighbor Project. Bookmark the permalink.